Welcome to the 2016 Glass Blown Open. 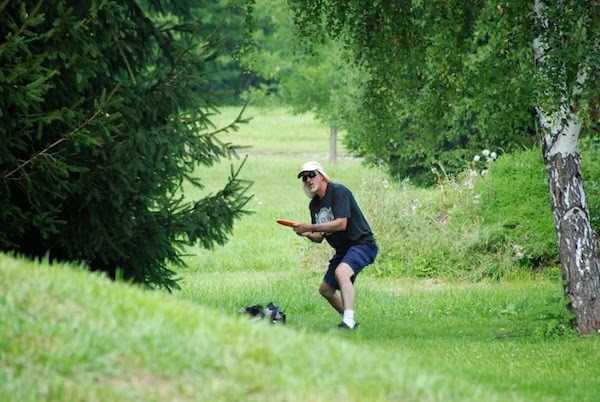 BRIGHTON New York—(Weekly Hubris)—April 2019—In 2016, I was relatively new to disc golf; it was the start of my 4th year of playing. In April, I drove from Brighton, New York to Emporia, Kansas, to join more than a thousand other players in the world’s largest disc golf tournament, the Glass Blown Open. On one morning, I happened to be on the same card with a professional disc golfer who was ranked No. 9 in the world. I was playing well. I was in the lead. This was my GBO moment. If you haven’t heard, disc golf is a thing. It’s better than ball golf (commonly just called “golf”) in myriad ways. Here’s just one example: in ball golf, playing a round with one of the world’s ten top players would only happen after you donated X-thousand dollars for the privilege of playing in a charity event. 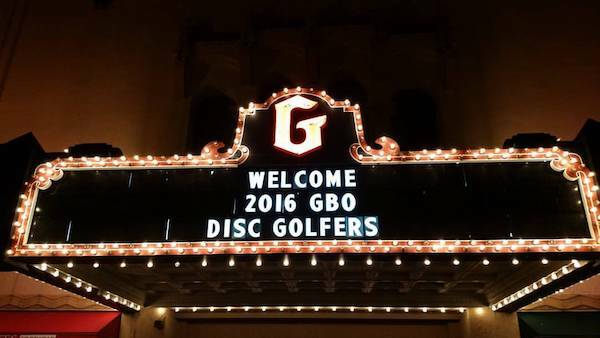 One of the ways that disc golf is better than ball golf is that a weekend warrior, in this case me, can pay $20 (not $20,000) to enter a PDGA tournament, and play a round with one of the world’s top-flight professionals. Here’s how it happened. I was at the Jones West course early to sign in for the one-day, one-round tournament. A player near me said, “I’m looking to form a group,” to which I replied, “I’m in!” On my right, another said, “I’ll join, too.” Doyle, Paul, and I would be the first group out. 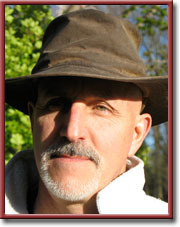 Doyle Jordan was not familiar to me, but I recognized Paul Ulibarri, a professional disc golfer. I’m not a fanboy; I don’t ask for pictures or autographs. So, I didn’t mention to Paul that I knew he was a pro, and Doyle didn’t either. Though on the same card, we were playing in different divisions: Paul, in Open (MPO); Doyle, in Advanced Grandmaster (AM-50); and I, in the Grandmaster division (MP-50). Focusing before a forehand throw. Both Doyle and Paul were low-key, easy to talk to, and a pleasure to have on the same card. The noticeable difference was that Paul was just carving up the Jones West course! It was entertaining to watch a skilled player throw a disc that lands at the basket 300 feet away. As the first group out, we were playing at our own pace with no waiting. When we approached the basket for hole 10, we could see the first tee, where a large number of players had amassed. Behind the tee box, there were at least six groups in the queue waiting to start. This was my GBO moment, because we were the lead card in both location and score, and each of us went wire to wire in our respective divisions for this one-day tournament. The first group out; The first group in; First Place Open; First Place Advanced Grandmasters; First Place Grandmasters . . . and all at the 2016, Glass Blown Open One Round Challenge @ Jones West. 2 Responses to My GBO Moment. It’s Disc Golf. It’s a Thing. Loved this story! GBO is on my bucket list. It is a one of a kind disc golf experience. My most fun week of disc golf each year. This year, 2019, will be my 4th consecutive GBO. I’m counting down the days until I jump in the car and point it to Emporia. I will have my over stable discs if (when) the wind howls. If it is on your bucket list, I would suggest blocking out time on your calendar now. Every GBO you miss means you will be one year older before you get to claim your GBO Moment.